Do the Amish really work harder than the rest of us? “Hard-working” is one of the positive stereotypes firmly attached to the Amish. We see barn-raisings, 4 AM milkings, and tending broods of half-a-dozen children or more, and it’s hard to suggest otherwise. But do the Amish actually work harder than the rest of us? Do they just work differently? Jim Cates explores these questions today with a look at how an Amish friend’s work differs from his own. It is tempting to wonder how The Adventures of Tom Sawyer might unfold if Mark Twain had made Tom Amish. Oh, the plot still works to have him trick his friends into the boring labor of whitewashing the fence. However, as an Amish lad, rather than lollygagging while his friends worked, Tom would have been busy building a sawmill, obtaining the board feet of lumber necessary to make pickets, and assembling sections for his workforce to paint, to be sold as prefabbed fencing throughout St. Petersburg, Missouri. Perhaps the Amish are not quite that industrious, but fiction has to be granted a certain amount of license! Suffice to say, the image of a thrifty, hardworking people is a stereotype rooted in truth. Still, the question arises: how does their work ethic differ from ours? The Center for American Progress reports that 70% of American children are living in homes where all adults are employed. On average, about 89% of males and 67% of females work over 40 hours per week. We continue to push back the average retirement age. And productivity for the average American worker has increased 400% from 1950. Still, we see the Amish as hardworking in a way that we are not. What gives? Compare my work ethic with the work ethic of an Amish friend for just a moment. We are both about the same age (no, I’m not telling), and both own and run our own businesses. He has a well-established construction firm, while I have an established private practice in psychology. Over the years we have talked enough that, despite the differences in our professions, I recognize very similar underlying business problems. And yet the way our “work ethic” manifests is very different. My only child is long grown and living independently. My friend’s seventh, eighth, and ninth children still live at home, and require of him a parental role. My care of “the animals” consists of one crotchety and demanding elderly cat. (I know – “crotchety” and “demanding” when referring to a cat is redundant.) His care of “the animals” includes numerous horses and cows. My responsibility for food involves a trip to the grocery store. His responsibility for food involves plowing, planting, and harvesting in the garden as his assistance is needed. And all this before he ever reaches his actual job! My friend is frequently up to complete chores and has breakfast in the wee hours of the morning, often by 3 a.m. In contrast I am a “night owl.” Many of my clients prefer late afternoon and evening hours, after school and work, and a late schedule suits me well. I find the quiet of the late night a good time to do paperwork and reports. Often then, I am going to bed about the time he awakens. By the time I am ready to “stand up” (an Amish term for waking up) and face my day, somewhere around 9 a.m., his is half gone. And yet our work ethic is alike in another way. One of his adult sons tells me, in an exasperated aside, that it is almost impossible to get his father to sit still and prepare proposals to bid on jobs. He would much rather be on the job site, acting as a foreman or working with the crew. He never seems quite as happy as he is perched on the apex of a roof, tools in hand, working to finish the framing of a house, barn, or any structure. Sitting behind the desk, saddled with the tedium of tallying figures? He delays it until the last possible moment. I understand all too well. The demands of filing billing, the need to review contracts, the renewal of licenses and certifications – all these are tedious enterprises that take me away from talking with clients and discussing their cases in reports. I delay them until the last possible moment. So the question remains: how is the Amish work ethic different? In one respect, the nostalgia we experience when viewing the Amish has an element of reality. The resistance to technology and the emphasis on maintaining as much of a farm setting as possible hearkens back to a rural America that no longer exists. That time period required a much more labor-intensive work ethic in the home than we experience in our postmodern world, one that the Amish still employ. A collective society further provides a watchful eye on work behaviors that our individualized society cannot. While I am reasonably certain that my relatives are proud of my profession, most live hundreds of miles away. They neither work with me, nor are they in a position to scrutinize my work ethic. In contrast, the Amish emphasis on family, church, and community creates an oversight and sense of discipline that naturally flows into work as an outgrowth of the cultural expectations. And lest we diminish the importance of our role, the Amish attempt to remain humble, but they are not unaware of the perceptions of others. The ongoing belief from the larger culture that Amish workers are superior no doubt adds to the strength of their work ethic and their efforts. They wish to continue to be seen as hard workers, a people standing apart in their abilities from the “slacker” world. 21 responses to Do the Amish really work harder than the rest of us? I am looking forward to reading The Adventures of Tom Yoder. It sounds like something the whole family will enjoy! Wow, rough commute Naomi. Glad for your family to be moving closer. Americans spend a ton of time in traffic. I just read that we spend over 5 billion hours/year in traffic, something like a work’s week worth of time per person. Guess that’s one big attraction of working at home. Lazy is a bad word. The Amish have a respect for hard, physical work that borders upon a religion. Being known as lazy is a label that most likely can’t be shaken off, while being hard-working forgives quite a few faults. A man can be harsh and stern but if he is hard working in addition, he most likely will be well respected. I believe that while most Americans work hard, our lives are not as satisfying. The Amish are productive in a manner that shows immediate results and gratification. I think most Americans feel better about themselves after a day of hard physical work rather than sitting behind a desk or sitting in traffic. It is human nature to want to move and get something done. Our lives have changed so much with technology that most things are done for us. Depression, obesity and laziness are factors in our culture that I really believe are a product of our modern lifestyle. In the old days, people didn’t have time to be depressed or lazy! I think people need to learn from the Amish and start taking more responsibility for their own existence. Plant a garden, build a shed, take up canning or learn to quilt…(even mow your own lawn rather than pay someone to do it!) Do something that will actually make you feel like you’ve accomplished something tangible. It can do wonders, really. Kelley, Boy did you hit the head on the nail with how our lifestyle is doing us in! People today might have to “work hard” but is it “hard work”? So many people have everything they think they have to have, and still are not happy. Our old friend Ann Landers used to say, “The most important things in life are not things.” The Amish can lead a good life with way less than the English life! Keep in mind, that in general, Amish do more physical labor than most of the rest of us. The majority of “English” use more brain power. Having said that, I am always amazed how smart my Amish friends are. Experience I guess, & handed down knowledge. Years ago, many Amish bought what was considered useless land relatively cheap from “English”, but within 5 years, this land was fully productive. They knew how to do this…. I am theoretically retired (by the traditional definition) and working “part time” in my own business. Some who know me well would say that I’m busier than I was before I retired. To them I say, “But I have trouble knowing when I am working and when I am playing.” That is, in a large part, because I thoroughly enjoy what I’m doing and see a fair amount of cross over. So I suspect a question about who works harder would need to consider how one defines work. The “English” tend to somewhat narrowly define and categorize things–we spend some time working, some time learning, and some time (usually not enough) playing. I suspect the Amish would have trouble with that; they are focused on a way of life that doesn’t necessarily make those distinctions. Who hasn’t seen a photo of Amish kids pulling a lawnmower with a bicycle or a horse? Are they working or playing? We “English” learn through college in preparation to work so we can retire. When you start to think outside those boxes, it becomes possible to have a “wholesome” approach that sees us always, regardless of age, learning, working and playing. I wouldn’t even say the Amish have figured out how to do that–they just never started seeing it any other way. I believe the Amish work harder. They don’t have all the newest and modern equipment that make life easier for the English. Seems all we have to do is push a button or click something on and they actually do a lot of physical labor. I agree it’s a good feeling to put forth physical effort to get something “done.” I did a lot more hard, physical labor when I was younger—and within the past 16 years or so, I’ve had numerous injuries and surgeries to repair (or partially repair) the damage I did to myself: 3 cervical spine surgeries (leaving me with one numb/weak hand–I need a typing stick to type with one finger on that hand, and a buttoner to button my clothes–, a knee replacement, and just last Sept., surgery to repair the 3 ligaments I completely tore away from the bone of my right shoulder—rotator cuff.That doesn’t count some “female” surgeries or other minor surgeries over the years. But I still like to do physical labor (when I still can), especially if it involves the outdoors–mainly, gardening. I enjoy working with Mother Nature in the background! That said, I have to put forth more “effort” to do things I took for granted 20 years ago–my body now has physical limitations I have to “work around”, if, indeed, I can manage them at all. Hard work is getting harder, but it’s also teaching me (and my family) invaluable lessons I might not otherwise have learned. One thing the Amish have that is a blessing—larger families that live close to one another. A couple dozen women cooking a meal & cleaning a house (as for worship service) is a lot easier work than if only one or two had to do it. Same with barn raising or quilting bees or anything else. Then there’s the built-in camaraderie of it all. I don’t know that the Amish work any harder, but they do work smarter, and probably enjoy it lots more than the English do! Blessed to live in a community where we were taught to work hard and help each other , too. We have time for fun, too. The comments raise a really interesting point. Right now in my time zone, it’s Friday at 6 p.m. I am whipped, and the only “physical” work I have done so far this week was mow the lawn! In some way would I feel better, or more satisfied, or less stressed if I had been physically employed? On the other hand, I think of my conversation with the fellow who came to service my air conditioner at 8 a.m. on Wednesday. He was pleasant, efficient, and did a lot of physical labor crawling around my attic – and when he left at 9:15, shared that he didn’t know how he was going to get everything done they had scheduled for him that day. Interspersed in the comments is the lack of balance in English lives, but sad to say, I have seen that among some Amish as well. Seems to be a human trait to get caught up in working to the exclusion of living well. My comment is about Amish children and work. I know three Amish farm families very well and am on each of their farms several times each year. Many times when I stop by, the children and teens of the families are busy working inside the house or outside in farmyard or fields. I know this can be taken to the extreme and not allow children enough free time. But, having grown up on a small family farm doing much of the same types of work Amish children do, and now living in a city the past 40 years, it greatly concerns me that children in the city do not have enough meaningful work to do, which can also result in lots of problems. I am looking forward to Tom Yoder to be released. I was recently helping my Amish buddy get things in order for his moving sale. When his mind is set on things that need to be done, there’s no stopping him. The one difference I saw was the help he received from his friends. Without question, they are willing to drop their own work to help a friend. I like to think that I am in reasonably good shape but when those guys got motoring it was something I was not accustomed to. I think we all can work just as hard as the next guy, it just depends what the agenda js and who’s setting the example. Then it’s up to you as to how much or little you want to do. Good points John. And to state the obvious there will be better/harder workers in any group including the Amish. Reading your comment another question that came to mind: do non-Amish compartmentalize their work more than non-Amish? The ultimate example would be the Amish farmer, who seems to have a day where work is intertwined with many other tasks and things that need doing can come up at any hour, eg waking up in the middle of the night to tend an animal or keep a greenhouse stove fire going. Amish who work 9-5 away from the home may have more clearly structured work/leisure periods of the day. On the other hand, for non-Amish technology has made it harder to compartmentalize work since it can always be taken home with the laptop, and the phone is usually on for work to intrude. Not to mention these devices are often mixed-use, used both for entertainment/leisure and work. I’m playing catch-up on some past articles, and in order to make the most of my time I didn’t read all the replies. If I end up repeating/echoing the thoughts of others in this thread, my apologies for the duplication. My first response to this comparing Amish work vs. English work is highlight the need to distinguish between productive work and busy work. How much time do we (the English) lose as our work has us scurrying from place to place, but getting very little done? Or the meetings — or the meetings to determine when we will have meetings — that often prohibit us from doing that which is really our job? 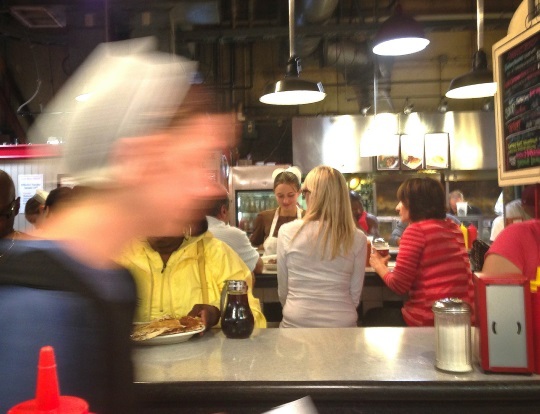 “Overhead” activity that demands so much of our time and attention is a far cry from productive labor, and it seems to me that the Amish, or at least the nature of many of their businesses, typically have a way to paring down so much of the fluff that is not really productive. 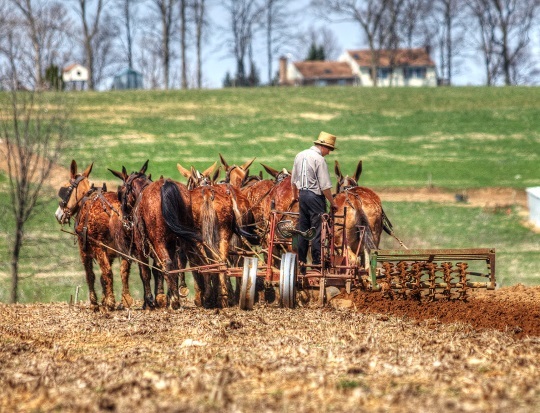 Second, Amish work is typically connected with the idea of quality, and quality is typically understood to be the result of higher standards and the discipline to reach those. Third, and somewhat connected to the second, is that Amish quality is often achieved with a much more hands-on labor. I seriously doubt that the typical English employee running a machine at the furniture plant or jelly-canning facility will put in the amount of actual labor and personal interest as his Amish counterpart does in his family-run business. Similar number of hours spent on the job is by no ways a means of equating the amount of difficulty/hard-ness of the work/labor that one does during that hours. I do not mean to demean the work ethic of the English, nor to overly glamorize that of the Amish. But my point is that for all the points of attempted comparison that tries to equate the two, I feel that in the final analysis it’s still more of an apples-to-oranges comparison. Well-taken points. And yet I think of the Elkhart-LaGrange Amish working in the trailer factories, and wonder about the steadily blurring lines between the Amish world you describe and the one that is emerging. They do seem to work harder! I will say though that their children carry a HUGE amount of that work load. The girl at home and boys at outside jobs. In addition here where we’re from… The boys give entire paychecks from 16 or younger until they’re 21 to their parents. Wow..think about that! Three or four able body boys bringing in additional pay checks. The girls are helping with the household chores younger ones. Our goal is to set up a girl with the basics: fridge, stove, dining room table, chairs, bedroom suite, couch, sewing machine, cookware, etc.) out of that fund. For a boy, a hose, buggy, harness, desk, basic tools, lawn care stuff, etc) and for all children quilts, canned goods & meat for the freezer, etc. Leave a reply to Do the Amish really work harder than the rest of us?